My first try at a jumbo granny square blanket was cut short, but will become a doll/mini lap blanket. Now, thanks to encouragement from Michelle, I've started a jumbo granny square, that will indeed be jumbo. As in, super chunky! The pattern reminds me of this giant doily rug, which I could also envision as a soft blanket. Such fun! And even though it has been a bit warmer and Indian Summer-like (I'm not sure if it's officially been called that? 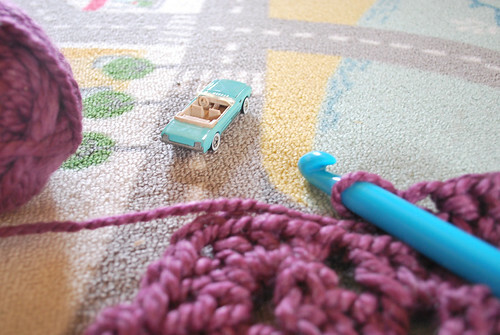 ), it is at last cool enough for bringing out the yarn crafts. Yay! Love the color! I'm sure it will turn out great!! Have fun!! The warm weather is totally throwing me off, too! But just seeing the corner of you chunky crocheted granny square is making me want to pick up the hook! Oh yes, LOVE that doily rug! I'm making a giant granny square blanket with chunky yarn, too! I can't wait to see your final product.